This is a first for me: I don’t know how to review this book. I don’t even know how to begin without spoiling this haunting, suspenseful story. 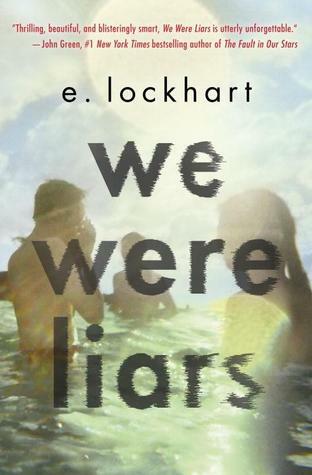 But I’ll begin this way: “We Were Liars” is the story of three teen-aged cousins—Johnny, Mirren, Cadence—and their good friend, Gat. Together, they are the Liars, and they spend their summers together on a private island owned by Cadence’s grandfather. Johnny, Mirren, and Cadence are Sinclairs, part of a rich, distinguished family that lives by the ideals and mottos of their patriarch. The story opens during Cadence’s fifteenth summer on Beechwood Island, the summer she falls deeply love with Gat. During the summer, Cady suffers a head injury, and is whisked away. But what exactly happened? Cady can only remember bits and pieces of the summer, and her family seems reluctant to fill in the gaps. And Cady herself is changed. She has debilitating migraines, and starts giving away her belongings. She dyes her blond hair—a symbol of pride among the tow-headed Sinclairs—black. When she returns to the island two years later, she is resolved to finally discover what happened. As her memories begin to return, the truth of her fifteenth summer begins to be revealed. This is beautiful book. The language is spare, almost poetic. The characters are complex, and I dearly loved the Liars. I never saw the ending coming…I never even came close. And it was perfect; stunningly, achingly, heartbreakingly perfect. This book will stay with me for a long time to come. This book does not come out until May 13th, 2014, but when you see it in your library and in your bookstores, you will remember this review, and you will pick it up. I am absolutely sure that you will love Cady Sinclair and the Liars as much as I did. I received my advanced copy from Edelweiss at abovethetree.com.